After reviewing an interesting collection of state and local flood-related news stories for the past year, it is the authors opinion that the events that attracted the most media attention were the historic accounts and memorial activities marking the 25th anniversary of the Big Thompson Canyon flash flood. This historic flood occurred during the late evening hours of 31 July 1976, when 12 to 14 inches of rain fell in the canyon area downstream of Estes Park. Considered by many to be Colorados worst disaster, the flood devastated nearly everything in the canyon and claimed 144 lives. The Big Thompson flood is credited with providing the motive for many local flood warning systems that are in place today, both in this region and elsewhere. While the District was fortunate to avoid flood disaster once again, the 2001 flood season was not without problems. The Districts 23-year-old flash flood prediction program (a.k.a. F2P2) experienced an above average number of "message days" with 42, compared to an average of 36, a record high of 52 in 1996, and a low of 23 in 2000. The National Weather Service issued flash flood watches affecting the District on 13 days in July and August, setting a record. Flash flood warnings were issued for 3 days, all occurring during in the same week in July. Eleven straight days of flood potential occurred from July 5-15, setting another District record for most consecutive "message days." Brief descriptions for a few notable events are provided later in this article. HDR Engineering, Inc. provided the F2P2 forecast services during 2001. John Henz, former president of Henz Meteorological Services, acted as HDRs senior project manager. Bryan Rappolt served as lead meteorologist. John and Bryan are both veterans of the program. This is the first year in the programs history that an engineering firm was selected as the meteorological support provider. With HDR being one of the Districts more experienced hydrologic/engineering consultants, this new role for them may open the door for other professional engineering firms to consider offering operational hydro-meteorological services. The F2P2 provides forecast and notification services directly to District local governments from mid-April through mid-September each year. Dr. Eve Gruntfest and Kim Carsell with the University of Colorado at Colorado Springs are working with the District to evaluate the effectiveness of Boulders local flood warning program. The Boulder/Boulder County Office of Emergency Management is the local sponsor of this research project. The study is using the latest findings and lessons from recent Colorado and U.S. flood disasters to assess the effectiveness of Boulders program and recommend ways to improve it. Successful aspects of other well-known local flood warning programs are being identified. A community survey was conducted to learn what floodplain residents understand about their communitys flood threat, the warning process, and personal flood safety. Preliminary findings have been presented. The final report will be completed by next spring and made available to interested parties. Eve was also involved with the behavioral science research conducted by CU-Boulder for the District after the Big Thompson flood. Geographic Information Systems (GIS) are widely used by local governments for many purposes. The District began efforts to develop its GIS capabilities in 1998 and recently initiated a project that applies this technology to recognizing flood threats. Bruce Rindahl, project manager for Brown and Caldwell, assisted the District in 2001 by developing a GIS interface that processes real-time radar and lightning data from the Districts satellite downlink and from the ALERT system. The radar data interface relies on software from Meteorlogix (formerly Kavouras) to convert data to a standard GIS format used by ArcView. Kavouras has been providing radar data to the District since 1979. The Internet was used to establish the ALERT data interface, making integration of other useful data sets possible. The next logical step will be to link site-specific flash flood guidance and decision aids contained in basin flood warning plans with GIS and build quantitative forecasting capabilities for use in the F2P2. This work is expected to begin in January and will be operationally tested during 2002. Eventually, GIS products will be disseminated to local governments and made available on the Internet with the expectation that flood threats will become easier to recognize, thereby enabling more timely and specific flood warnings. What can individuals, families, and businesses do to protect themselves from floods? By choosing to better understand the risk, learn some safety rules, write a simple plan, and spend a few dollars to protect personal propertymuch can be done to keep damages to a minimum and prevent loss of life when the next big flood hits. Boulder and Denver, with assistance from the District, are developing flood protection handbooks and webpages to help citizens help themselves. The publications will be completed by the 2002 flood season, but the real success of this effort will be determined by the willingness of individuals to act. Marketing this idea will take some creative thinking and it will be interesting to observe this process. Hopefully it will not take a flood disaster to generate public interest, but it may. The ALERT system continues to provide valuable early flood detection and decision support for the District. It now includes 148 gaging stations that provide 134 real-time rain measurements, stream and reservoir water levels for 68 locations, and weather data from 16 mesonet stations. The Districts data appears to be coming quite popular. Prior to developing the website, ALERT users had to either connect directly to the Districts system by modem or request data from District staff. Now, only a handful of requests for data and remote access privileges are received annually. Due to an increasing demand for historic data, the District recently added archive data retrieval capabilities to the website. Users can now obtain data online from as far back as August 21, 1985 when the first PC-XT base station became operational. Many local government users still desire the ability to dial-in to the ALERT system, which is sometimes necessary when the Internet gets busy like during local severe weather events. To better accommodate these users, the District recently acquired a site license upgrade for new Windows-based software known as "Remlynx," replacing the old REMDOS graphic terminal software. Remlynx is designed for modern PCs and is capable of modem and Telnet connections. Little Dry Creek at 64th rain/stream gage. Funding agreements with Denver and Aurora were signed in December allowing further network expansion in 2002. One project will cover Marston Lake area in southwest Denver and the other will involve the Upper Sand Creek basin. New weather stations will be installed at Marston Lake and Aurora Reservoir. DIAD Incorporated may install a third weather station at their Longmont offices to facilitate testing of sensors and new equipment designs. DIAD provided the 2001 ALERT maintenance services for the District and Boulder County. More stations also appear to be on the horizon. Within the past month the City of Boulder expressed the desire to install at least two new rain/stream gages along South Boulder Creek downstream of Eldorado Springs. With such a high level of interest by so many, it is difficult to predict just how big the network will grow. Three days of steady upslope rain saturated soils along the Front Range. Rainfall amounts totaled 2 to 3 inches over much of the District causing some minor street flooding while larger streams like Cherry Creek and the South Platte River rose above normal. Two reservoirs monitored by the ALERT system recorded their annual peaks on May 5 (see table). No rainfall rate alarms occurred during this 3-day wet period. 2001 Peak Flows. Some of the more notable peaks measured by the ALERT system. While the District was under a low threat flood potential, the small community of Ellicott east of Colorado Springs was hit by a tornado leveling the high school and some mobile homes. Minor street flooding and 1" diameter soft hail was reported in Lakewood. This day is probably considered Colorados worst weather disaster of 2001. At 7:20 p.m., heavy rain and damaging hail struck DIA causing more than $49 million in damage. That estimate did not include undisclosed damages sustained by the airlines at DIA. Between 40 and 50 mobile homes were also damaged in the Watkins area. Messages concerning the possibility for storms were issued for the entire District at 4:10 p.m. No major flooding was reported. Fast-moving storms accompanied by high winds dropped 1.85 inches in less than an hour over Aurora during the rush hour. Rainfall rate alarms occurred at four ALERT gages in the general vicinity of I-225 and Sand Creek. Annual peaks were recorded for three stream gages in the same area. This day marked the beginning of 11 straight days of flood potential for the District and a 45-day siege of monsoon storms for the region. Serious street and stream flooding hit Denver hard between 4 and 6 p.m. The storms were accompanied by high winds and small hail. Damage to the Cherry Creek Arts Festival was a major news story where one person was taken to the hospital after being struck by blowing debris from street displays. Flash flooding was observed on Harvard Gulch, Goldsmith Gulch, Cherry Creek, the South Platte River, and along I-25 where the infamous "Lake Logan" (Logan St./I-25 underpass) once again stopped traffic. The Harvard Gulch at Jackson Street rain gage measured the heaviest rainfall of 0.67" in 5 minutes and 2.48" in an hour. Additional reports of flash flooding were noted in Centennial and Englewood. This was the main record-setting day for the ALERT system with rainfall rate alarms occurring at 17 stations. Annual peaks were recorded by 16 stream gages with 5 breaking their historic marks. The District and affected local governments were made aware of this days flood potential before noon, thanks to the forecasting talent of Bryan Rappolt. In the morning the NWS did not believe the threat warranted a flash flood watch, but as conditions worsened in the afternoon appropriate flash flood warnings were issued. 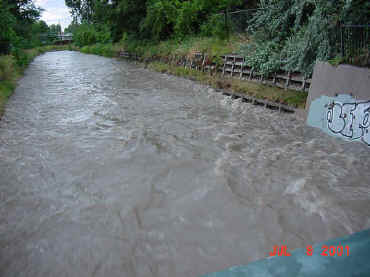 Goldsmith Gulch upstream of Mexico Avenue on July 8, 2001. A reconstitution of the storm performed by HDR Engineering showed that rainfall totals might have exceeded 4 inches along Colorado Blvd. between I-25 and Evans. The Harvard Gulch rain gage mentioned above is in this area and may have experienced considerable undercatch due to high windsa well-known accuracy problem for ALERT rain gages. Harvard Gulch did experience a record flood, but it is somewhat unclear why the extent of flooding wasnt worse with much of the upper basin receiving more than 3 inches of rain according to the HDR study. Further study will be needed to answer this question. This event came very close to causing much greater property damage. More serious consequences were avoided for two main reasons: 1) existing flood control and drainage improvements prevented major damages; and 2) the rain stopped before the capacity of these facilities was exceeded. Another inch of rain and we would be telling a different story. Click here to view a slideshow presentation of the July 8 flood prepared by Bill DeGroot. A fast developing storm formed over central Jefferson County dropping 1.5 inches in 35 minutes while a second foothills storm hit the Evergreen area with similar amounts. A flash flood warning was issued by the NWS for upper reaches of Bear Creek above Evergreen where one-hour radar rainfall estimates exceeded 3 inches. Rain rate alarms occurred at 8 stations and 4 annual peaks were recorded. Dual "Friday the 13th" storms deluged Arvada and Aurora. Radar-estimated rainfall of 2 to 3.5 inches was noted in northern Arvada over Little Dry Creek An observed 1.7 inches in less than an hour caused heavy runoff in the Toll Gate Creek basin and along Sand Creek in Aurora. Rain rate alarms occurred at 9 stations and 10 stream gages record annual peaks. A long track multi-cell storm complex developed over the northwestern Jefferson County foothills about 3 p.m. The storm produced severe weather in the form of damaging hail and high winds across the foothills north of Golden, Rocky Flats, Broomfield and west-central Adams County. A Thornton official reported the heaviest rainfall amount of 3.7 inches, which caused serious street flooding. High winds and heavy rain produced street flooding problems in northern Aurora, near Barr Lake, and at DIA. Intense rainfall was also measured by the ALERT system in the Parker area. A highly localized storm impacted rush hour traffic around the Denver Tech Center. Hail, wind and rainfall amounts exceeding 1.2 inches in 30 minutes slowed travel on I-25 and I-225. Funnel clouds were also reported. The South Platte River gage at Union Avenue recorded its record flow for the year, as did the Slaughterhouse Gulch detention basin at Grant Street. Rainfall rate alarms occurred once again in the Goldsmith and Harvard Gulch basins, but the flooding was not nearly as severe as July 8. The "final" big storm day of 2001 hit the Boulder and Jefferson County foothills with four active storms dropping more than one inch in 30 minutes. The heaviest rainfall was noted over Morrison (1.61"), Turkey Creek (1.50"), and South Boulder Creek (1.34"). Rain rate alarms were triggered by 6 ALERT gages and 2 stream gages in the Bear Creek basin recorded their annual peaks. Very active lightning accompanied these storms.